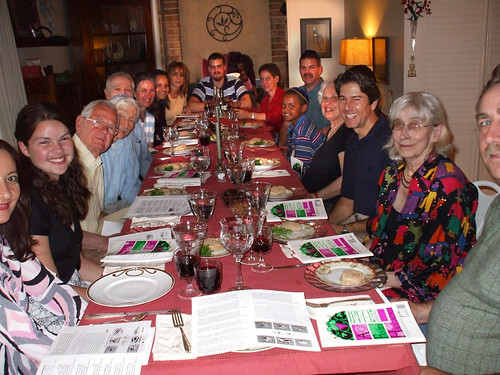 The Pivar family at their 2008 Seder. We use this holiday as an opportunity for our whole family to spend time together at least once a year. Since some of us live in different areas of the country, itâ€™s rare that we are all in the same place at the same time too often anymore. Al and Mary have been celebrating Passover at their home every year since my grandmother, Minnie Pivar passed away. About 6 years ago, attending Passover dinner together was considered optional, but then my dad, Alvin PivarÂ made the decision that â€œoptionalâ€ would no longer be the case, so here we are, every year, sharing Passover at the Pivarsâ€™ house and enjoy a reunionÂ that provides plenty of time to catch up with each otherâ€™s lives. It was the best decision he could have made for the good of all of us. Thereâ€™s nothing like spending time with your family and the fact that itâ€™s Passover makes it that much more special. Mary goes out of her way to make sure that nothing is overlooked and that the family traditions which began many years ago at Minnie and Edward Pivarâ€™s Passovers dinners remain true to form. She makes sure we useÂ the same yamakas, dishes, silverware, books and afikomen routine dating from back to when I was just a little girl, and probably much furtherÂ for thoseÂ that had the pleasure of sharing the holiday with them beforeÂ I was even born, I’m sure. Mary and Gertie Shear, (Gertie is Donaldâ€™s wife of more than 50 years, and Donald is dadâ€™s first cousin on my Grandfatherâ€™s side. He is the son of Edward Pivarâ€™s sister, Blunky) do their best so that the recipes for each dish are as close to Minnieâ€™s as possible and equally, if not more so, delicious. By looking through the many photographs on the web site so generously provided by other family members, I noticedÂ many that were taken inside both residences I remember of my grandmother and grandfather. So, I know that many of youÂ had the pleasure of sharing holidays with them too. Every year, Alvin, his first cousin, Donald Shear (check out the photos, they look more like brothers) get together to decide who will handle what, as we go through the ceremony. They huddle together determining whose responsibility it will be to keep a close eye on the afikomen to ensure that it will absolutely, positively, NOT disappear. As everyone knows, itâ€™s necessary for the completion of service. With the kids watching with the same intensity, well, you know the rest! Once the all important negotiations for retrieval finally commence and finally, the singing of Chad Gadya, another Pivar Passover comes to a close until next year. I know I can speak for all of us when I say we feel blessed to be able to make this happen every year. I have included photographs for you to become familiar with the family members you may not have met yet and some of us that I know you havenâ€™t seen for a while. We hope you enjoyed hearing just a bit about how we celebrate and now we look forward to hearing about you too. Happy Holiday!